Increasingly in America today—and in other countries, as well—there are two achievement gaps in our education systems. The first of these— well-documented, widely discussed, and the focus of education reform efforts for the past decade or so—is the gap between the quality of schooling that most middle-class kids get in America and the quality of schooling available for most poor and minority children—and the consequent disparity in results. The second one is the global achievement gap, as I’ve come to call it—the gap between what even our best suburban, urban, and rural public schools are teaching and testing versus what all students will need to succeed as learners, workers, and citizens in today’s global knowledge economy. As a country, we’ve been striving to close the first achievement gap by bringing our poorest schools up to the standards of our middle-class schools—mainly through increased testing and greater accountability for progress, as measured by the tests. However, it has become increasingly clear to me that even in these “good” schools, students are simply not learning the skills that matter most for the twenty-first century. Our system of public education—our curricula, teaching methods, and the tests we require students to take—were created in a different century for the needs of another era. They are hopelessly outdated. 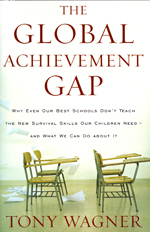 The global achievement gap remains invisible to most of us—in part, because it is fueled by fundamental economic, social, political, and technological changes that have taken place so rapidly over the last two decades that they seem more like static in people’s lives than like tangible forces that are shaping our future. But these changes are powerful, and until we understand them and rethink what young people need to know in the twenty-first century and how they are best taught, our future as a country remains uncertain. In this “newly flattened world,” to borrow a phrase from Thomas Friedman, the universe in which our children must compete and succeed has been rapidly transformed by groundbreaking and rapidly evolving technologies, as well as by the stunning economic growth of countries such as China, India, Thailand, the Philippines, and many more. Similarly, since 9/11, new threats to our democracy have emerged. And now global warming may threaten the systems that sustain life on this planet. To deal with these challenges and others that will inevitably emerge, we need to ensure that students are differently educated for the future. If we were “a nation at risk” in 1983—a phrase that comprised the title of a famous education report released that year decrying the “rising tide of mediocrity” in our public education system—we are today far more seriously at risk than most people realize. And while No Child Left Behind (NCLB) was well intended, its implementation is, in fact, putting all of our children further behind in acquiring the new survival skills for learning, work, and citizenship. I came to understand the concept of the global achievement gap through my research on the competencies that young people need today in order to be prepared for the world of work. I wanted to find out what a high school graduate today would need to know in order to succeed at a “good” job that paid more than minimum wage. I wanted to know how employers assessed the preparedness of our high school and college graduates to compete for good jobs with the rapidly growing number of well-educated young people from other countries. I was also interested in exploring the extent to which adapting to the needs of the workplace might be at odds with being an independent thinker and a good citizen—a disparity that many educators assume to be the case. For I believed then—and still do—that we will have gained little as a country if we solve the problem of preparation for work at the expense of preparing all students to be active and informed citizens in a democracy. We must do both.